Muc-Off released a new kit, developed in partnership with Triumph that is available exclusively via the Triumph dealer network. Muc-Off is offering industry-leading cleaners, protectants and lubricants to Triumph motorcycle riders and fans worldwide. 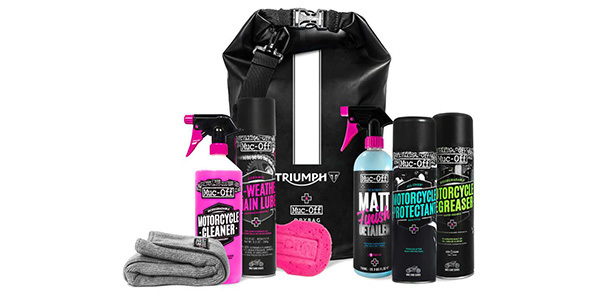 The Triumph Motorcycle Care Kit (OEM’d by Muc-Off) includes all a rider needs to clean, protect and lube their motorcycle. It’s suitable for any adventure, cruiser or sports motorcycles and will safely clean their bike, front to back, is safe on delicate surfaces and finishes including metals, matt/satin/gloss paintworks, plastics, acrylics and carbon fiber. The advanced range of Muc-Off products include those to remove dirt, grease and grime. Protect the motorcycle against corrosion and dirt adhesion and then an all-weather chain lube, ensuring your drivetrain keeps running smooth. 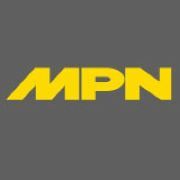 This comprehensive range of product offers unparalleled cleaning performance, keep the motorcycle looking factory fresh and performing at its very best no matter what or where your bike takes you.